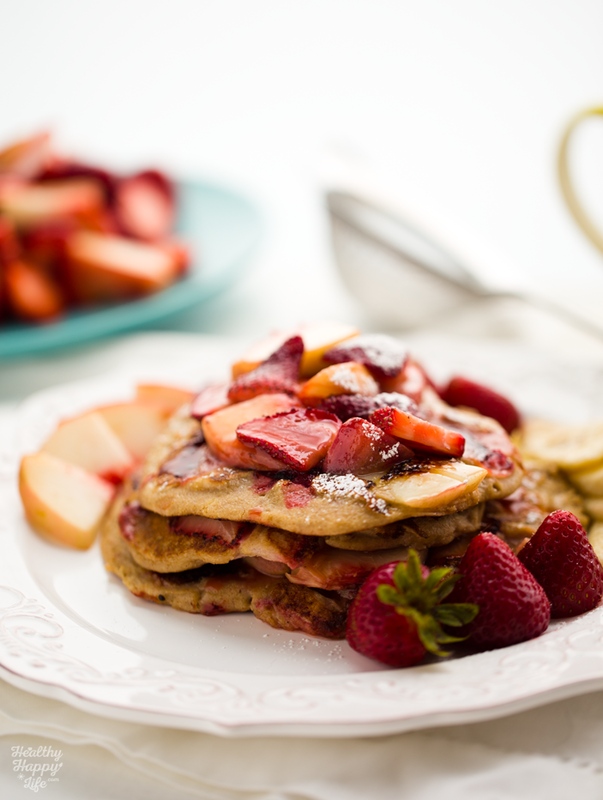 Strawberry Peach Walnut Oatmeal Pancakes. Gluten-Free. Vegan. 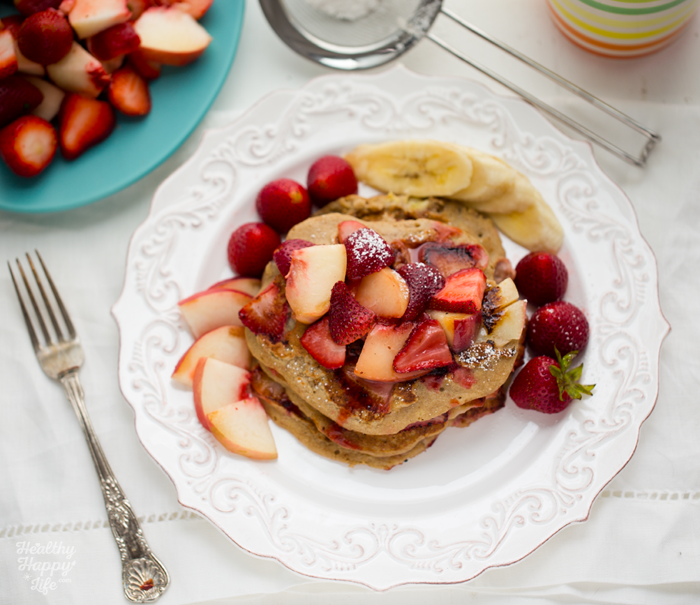 "A day that starts with pancakes...."
Always use organic peaches and berries when possible since these delicate fruits do not have a non-edible skin protecting them. Splurge on organic berries and peaches in the summertime when you can often find them on sale. Or head to a farmer's market and seek out a deal. ..OK, so sometimes I spend MORE at the farmer's market than I would at a supermarket because my eyes are bigger than my stomach, but still. You get the picture. Buy local, or trek out to a pick-your-own farm and load up on summer fruit goodness! 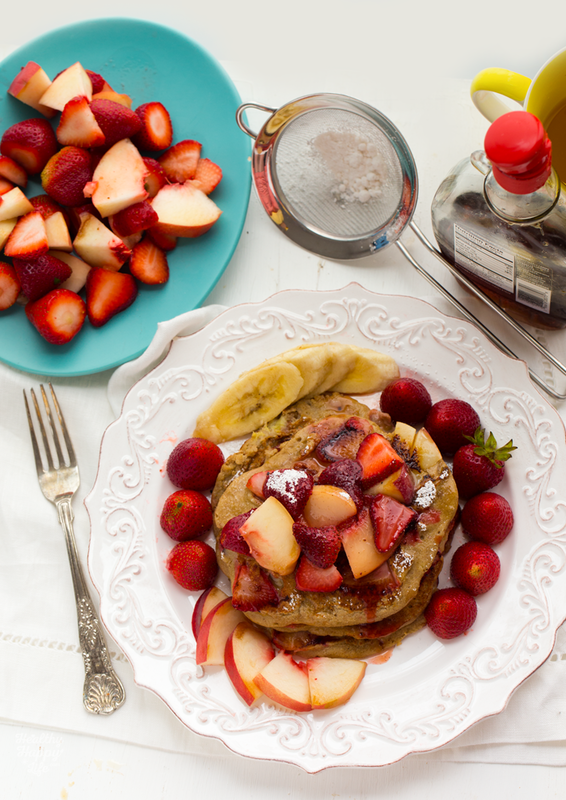 Summer fruit + pancakes = match made in breakfast heaven. Grade B maple + organic powdered sugar to further sweeten the pancake platter..
Ready for YOU to dive into..
Today. It is a Tuesday. Overcast skies and warm muggy weather here in LA in the days after those crazy July rain showers. This weather makes me want to stay inside, work all day next to snuggly kittens, take an afternoon workout break, play in the kitchen and fall back into bed at the end of the day, cozy and relaxed. 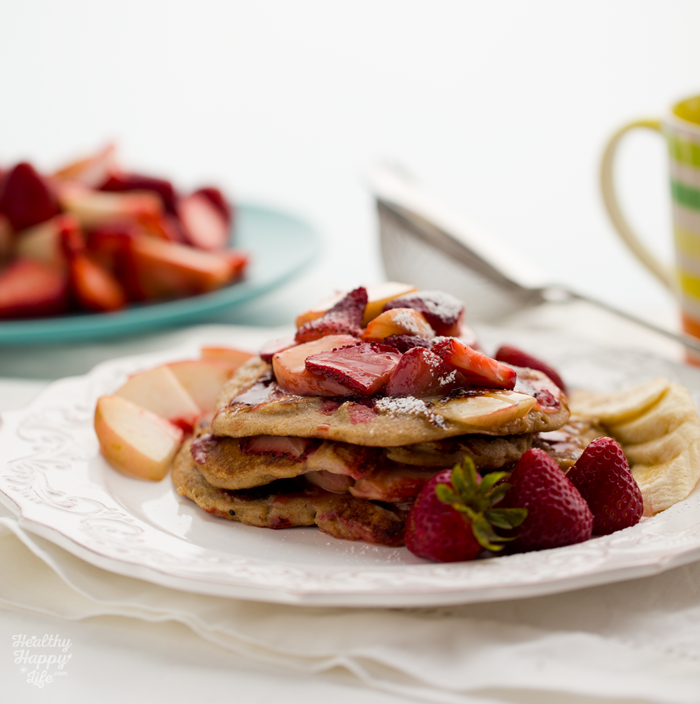 A day that starts with pancakes will leave you feeling cozy and warm, satisfied, nurtured and deliciously mellow. 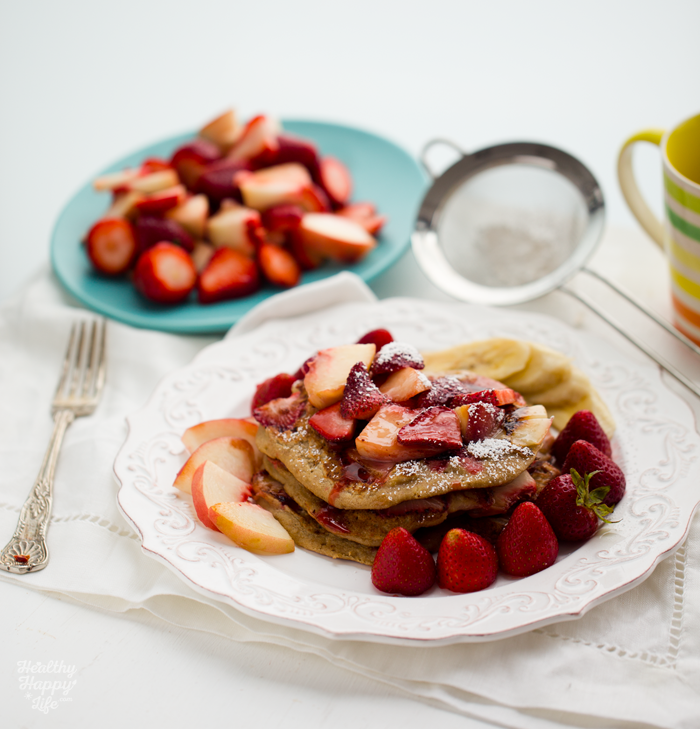 Weekday pancakes? Sure, why not. It is true my kitchen was extra messy with bowls for fresh fruit, stained red and pink. Bowls for mixing batter, scattered strawberry tops cluttering the sink, powdered sugar sprinkled like fairy dust all across the table and a skillet to clean. But despite the few extra minutes of clean-up. Pancakes are always a "Yes, please!" meal for me. So, pancakes. Say it with me. Pancakes. Just saying that word makes my taste buds smile. 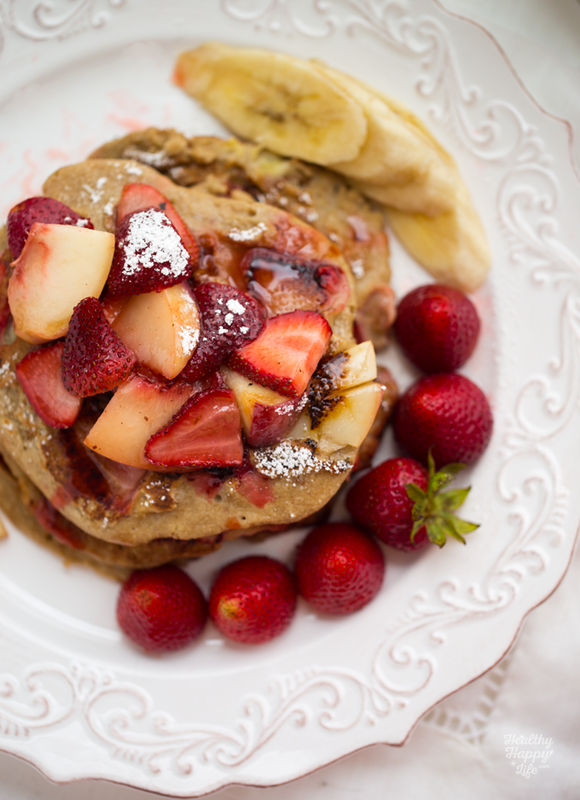 I hope you try these summertime, fruit-filled, vegan, gluten-free pancakes with walnuts and cinnamon, lemon zest and maple syrup. 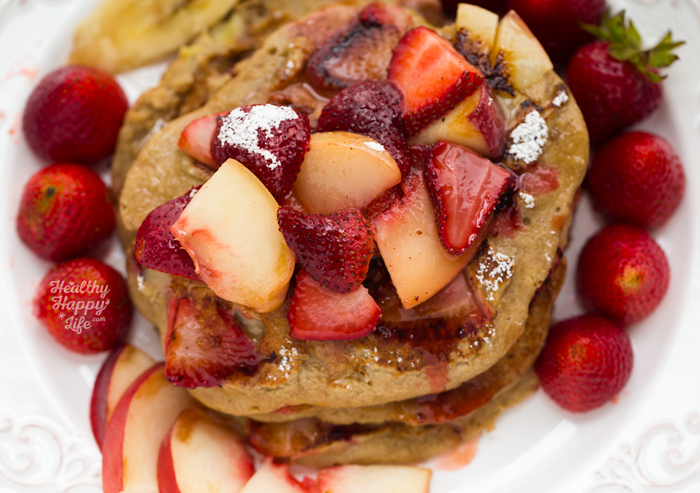 Warmed fruit and fluffy oat goodness in every forkful. Make these and have a good day. PS. This recipe (similar to it) can be found in my cookbook Healthy Happy Vegan Kitchen - along with my tips on homemade flours and more breakfast inspiration. Get your copy! 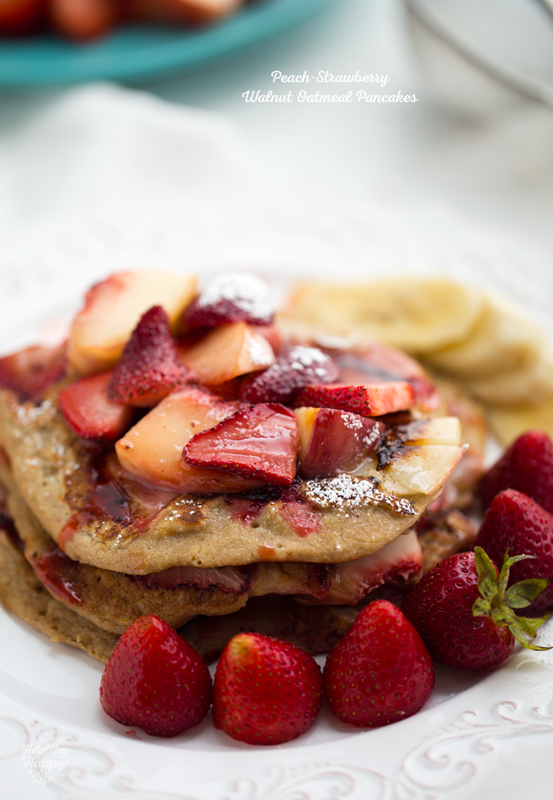 Strawberry and peach filled oat flour pancakes with walnuts and cinnamon. 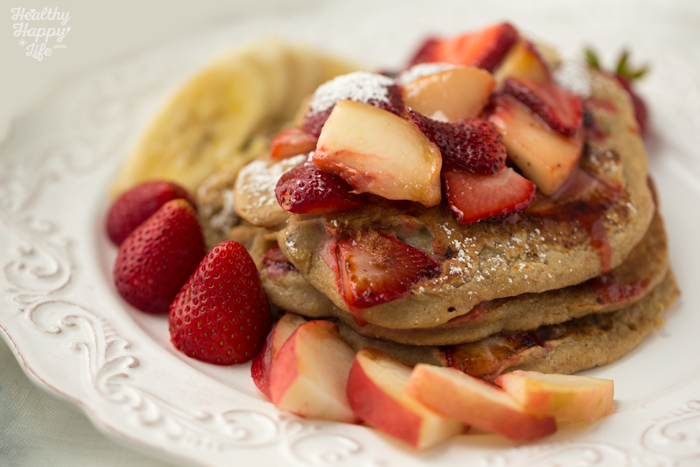 Topped with warm maple fruit and a hint of organic powdered sugar. Mash the banana in a medium mixing bowl then add in the non-dairy milk, lemon juice and maple syrup. Then stir in the dry ingredients: oat flour, cinnamon, baking powder and salt. Stir with a spoon very well until the mixture thickens. Allow this batter to sit for a minute or two to fully thicken. Fold in the walnuts and about a 1/2 cup of fresh fruit. Warm up skillet over low heat for at least 2-3 minutes before cooking. I find that this helps to evenly warm up the pan. Turn heat up to medium and spray pan with oil. Add pancakes batter. Cook about 2-3 minutes, or until edges start to brown and firm up and bubbles start to pop up around edges. Right before flipping, add a few additional fruit slices to the wet side of the pancake, spray with oil and flip. Cook this side for another 2-3 minutes. Remove pancakes from pan and start again until all the batter is used. I made three large pancakes. 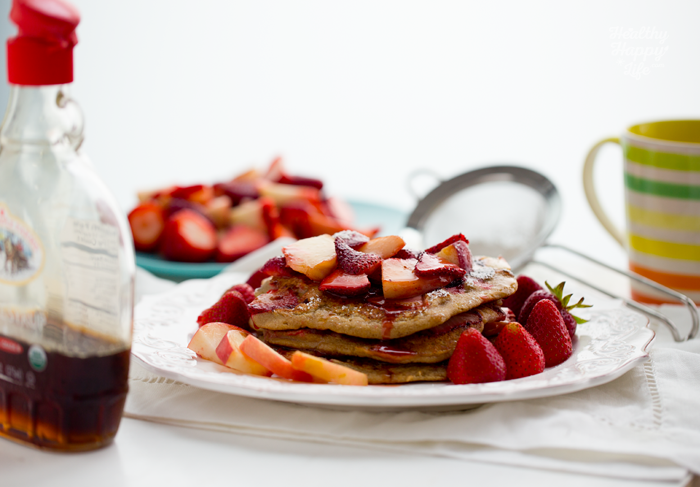 When the pancakes are done, add the fruit topping fruit and maple syrup to the pan and toss around with your spatula for a minute to warm, soften and caramelize the fruit. Turn off stove heat and set warm fruit aside. 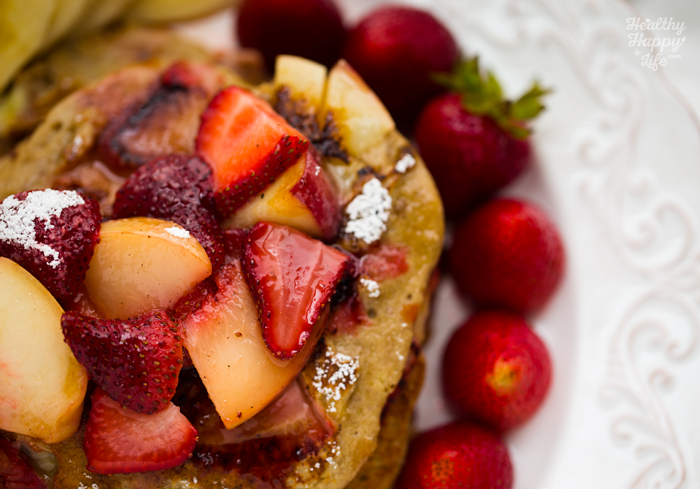 To serve, add pancake(s) to plate and top with the skillet fruit and garnish with fresh fruit. Add additional maple syrup if desired. Sprinkle organic powdered sugar over top.